For more than 80 years, the oil and gas industry has used seismic methods to construct images and determine physical characteristics of rocks that can yield information about oil and gas bearing structures in the earth. 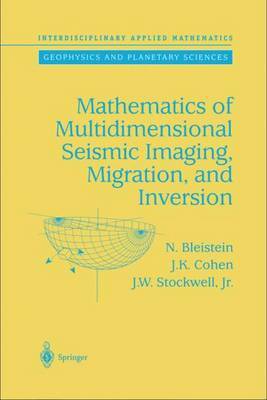 This book presents the different seismic data processing methods, also known as seismic "migration," in a unified mathematical way. The book serves as a bridge between the applied math and geophysics communities by presenting geophysicists with a practical introduction to advanced engineering mathematics, while presenting mathematicians with a window into the world of the mathematically sophisticated geophysicist. "The presentation is exceptionally good, with a systematic progression from simpler to more sophisticated problems. This is very helpful to those readers not familiar with the subject...Every seismological term and every necessary mathematical concept is explained so that the book is actually self-contained...The mathematics are...kept are at a sufficiently low level of mathematical sophistication to make the book easy for its intended readership...Another advantage of the book is a careful choice of the variables...Exercises stimulate the reader's initiative and inquisitiveness. This is rather unusual in geophysical literature...Even for seasoned seismologists the book will provide an incentive to upgrade their know-how."